A group of eight bands and singer-songwriters will hit the BMI sponsored stage at the 2015 LouFest. 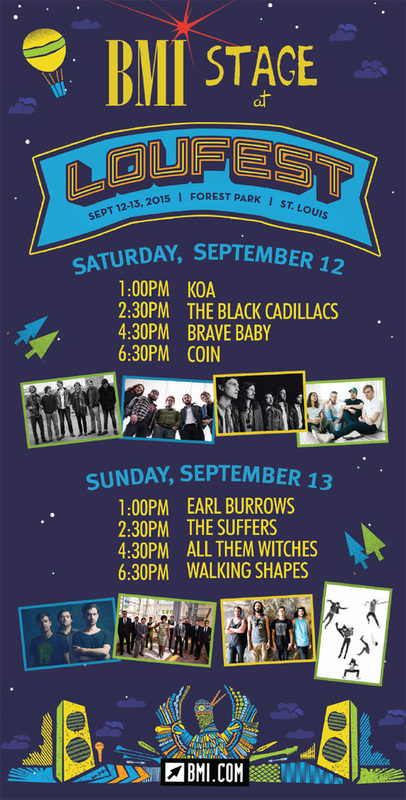 Running Saturday, Sept. 12, and Sunday, Sept. 13, in Forest Park, St. Louis, festival headliners include Hozier, Ludacris and The Avett Brothers. Now in its third year, the BMI stage will kick off the festival at 1 p.m. each day, setting the pace with top-notch burgeoning acts. Performers range from the seven-piece funky jam band KOA to Nashville’s synth-pop group COIN to Texas soul band the Suffers to the dark and bluesy All Them Witches. Rounding out the lineup are The Black Cadillacs, Brave Baby, Earl Burrows, The Suffers, and Walking Shapes. In addition to LouFest, BMI also sponsors stages at other C3 Presents’ music festivals Lollapalooza and Austin City Limits Music Festival, offering prime showcasing opportunities to BMI songwriters.